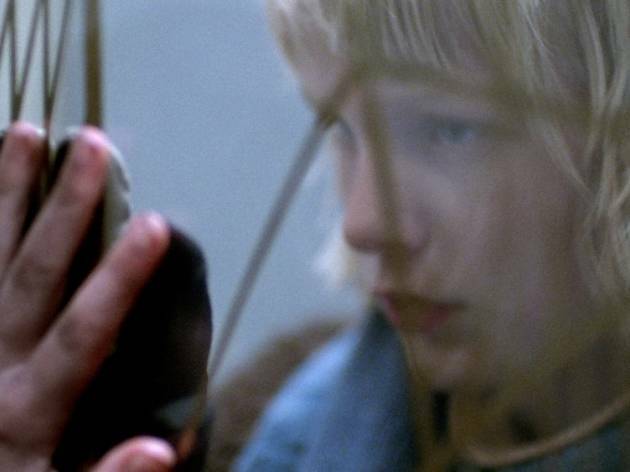 ‘Let the Right One In’ borrows its title from a Morrissey song, but don’t let that put you off. It’s an angular and lusty tween horror movie based on John Ajvide Lindqvist’s bestseller in which lonesome, whey-faced 12-year-old Oskar (Kåre Hedebrant) becomes smitten by a young, female vampire named Eli (Lina Leandersson). After initiating an adorable romance in the snow-coated forecourt of their glum housing complex, they soon realise that both of them are baying for blood. He’s privately fantasising about stabbing up his schoolyard tormentors with a pocket knife and she needs to sate an appetite for the red stuff that keeps her from dropping dead… again. It might sound a little like recent coffee-table vamp style exercise ‘Twilight’, but this is a more sinister and ambiguous work. It runs on similar rails to something like Abel Ferrara’s ‘The Addiction’ in that it retools the themes and metaphors that stem from the vampire myth – craving, hostility, impulsiveness, eroticism – and neatly dovetails them with a cool, sort-of-realist examination of the horrors of adolescence and poverty that triumphantly ditches cliché and overstatement. 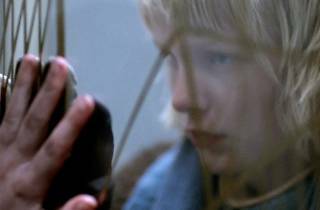 Tomas Alfredson’s light, subtle direction, combined with DoP Hoyte Van Hoytema’s crepuscular visuals, makes the courtship elements all the more tender and the staccato scenes of extreme violence all the more disturbing. The bashful, impassive hue of the central performances also gives the film an anything-could-happen edge: feelings of anger and desire don’t provoke hysterical outbursts but remain bewildering within the minds of the juvenile cast. Where the film falters is in its (arguably) reactionary final scenes. There’s an eye-wateringly vicious romantic gesture that celebrates Oskar’s new-found fondness for violent revenge without ever allowing him to step back and survey the absurd amount of damage that he and the young bullies have wreaked. And for a film that takes time to embrace small, tender details, especially in relation to Oskar’s sexual awakening, it does precious little to flesh out the bleak context of his relationship with Eli, when eccentric side characters (including a cat lover who is brutally mauled by his own cluster) are thrown in as madcap story padding. But these are mere quibbles as this bruised and brilliant fairy tale is one of the year’s true originals. This film is honestly one of the creepiest things I've ever seen. Not because it's scary, per se, don't expect to be jumping out of your seat. More so that it's really sad, and kind of sinister, all at the same time. It's a little slow moving at times but the whole concept just makes it eerily watchable. Vampire kids, hanging out, being surprisingly unbadass? Sure. Bella thank you for speaking to me like an adult unlike an ignorant reader earlier. If you like foregin horror films check out Cold Prey and Switchblade Romance, they are gripping and tense. I just didn't feel this was a horror film at all, but the pool scene at the end was top notch. I was waiting all film for something to happen but it was mostly dialouge. I am a huge horror fan but I didn't think it was in the same league as the two films I mentioned above! Re: Thomas Noctor I am not old but I am not young. I have seen many films and LROI is in the top 5. I am about to get my PhD in fine art and I've seen the film for 5 times now. It is the one of the most outstanding examples of films made in 21st Century and will be studied and talked for years to come for its superb cinematography, engaging narrative, top quality screen play and brilliant execution. So I disagree with most of your comments about this film. And you are loosing out a lot for depriving yourself of a chance of being the true spectator of this masterpiece. If I can make this kind of quality film, I am ready to die without any regrets about my life. Astrid You scumbag, how dare you insult Me, I'm just giving My opinion, go f##k yourself! This film is crap, half naked kid at the start? Creepy alright! Not art at all, the only decent scene is the pool scene at the end, and thank God it was the end. Not scary and extremely boring. As boring as The Road and Drag Me To Hell! classic !!!!!!!!! Great soundtrack to ! As a film maker myserlf I first off will say killing scenes are very well done. This is a shockingly boring film more like a teletubbie Romeo and Juliet than a horror. The girl doing the Rubix cube is the best part of this bore, not as bad as Drag Me To Hell though but not far off worst film of the year. This was a superb blend of creepy horror and sensitively nuanced film about the pains of adolescence and young love.Cold,suburban 1980s suburbs of Stockholm,the banal setting of estates where people lead quiet,ordinary lives. Oscar is bullied at school by a gang through being studious and introverted. He hangs around his estateâ€™s courtyard at night to find that a young girl,Eli, a vampire(he doesnâ€™t yet know) is drawn to him. There have been murders going on where bodies have been drained of blood. Eli lives next door to Oscar with an older man she calls dad. The beautiful coldness of the landscape and the extremely moving relationship of the two adolescents(though Eliâ€™has been 12 for a long timeâ€™) brings a tenderness out of the gory subject matter.There are decapitations and blood-letting and Eli is surprisingly nimble when she springs onto each victim, yet Eli and Oscar make a genuine bond of friendship and love,both needing and complementing each other. Atmospheric and poetic and yet real with some amazing cinematography and great scenes, breaking mind-forged clichÃ©s of an old genre,placing it alongside The Orphanage and The Devilâ€™s Backbone,films with a new imaginative awareness. The swimming pool scene is mind-blowing. The last scene on the train with Oscar tapping the lid containing Eli suggests them going to new pastures. Is Oscar a future Colombine killer in the making? Ok first off I'm a huge horror fan and am open to alot of types of horror. If your expecting an exciting nerve wrecking film then skip this. I have to say the killing scenes are top notch, and as a film maker myself I have to say well done for that. Its more Romeo and Juliet than a horror and its incredibly boring. I dont know the camera crew stayed awake. Poor flick, not as bad as Drag me to hell though!!! An excellent film. A slightly different take on the vampire them. Superbly acted and tenderly shot (apart from one unnecessary gratutous shot - why?) I would have given it the extra star but for the slightly dodgy affects work during the attack scenes (the cats and under the bridge). The ending was not too bad. It would have been good to understand how Eli got infected to start with. On an aside, why do people bother posting they are going to see the film?! Get a life. I watch on average two or so films a week and this is by far one of the very greatest of films i've ever seen....i would definately go so far as to say it's a masterpiece of the horror genre. I didn't like the film at all, and wouldn't want to see it again, although it's undeniably different from your average vampire movie. My wife thought it a masterpiece. Left a real sense of haunting for a few days after watching this superordinary movie: The Scotsman & InTheNews.co.uk review this film magnificently - but watch it before reading I strongly advise. Best film I've seen in years. Go! Wonderfully absorbing creepy film. The atmosphere is literally chilling, beautifully photographed with a quietly brooding and edgy soundtrack. On a par with psychological horrors like Orphanage this is a brutal but tender adolescent romance fantasy. Best film I've seen for a while, with some imagery which will haunt me for a while. Agree with TO about the gratuitous ending which was disappointing, but the rest is spellbinding, like the best fairy stories. Incredible film. Cast and acted brilliantly. Horribly shocking and gorey whilst being tender and full of emotion. A superb original take on the vampire theme. Loved it! Good movie - a bit slow - and a bit edgy but I enjoyed it ... fyi it is subtitled! Extremely beautiful and chilling, A horror film for people who don't really like horror films. its way more interested in the inner lives of the characters than blood and gore and all the more rewarding for it. Nearly perfect.